All sales final. No warranty, refund, or exchange. The K100 is a real Mechanical MOD. So the product's lifespan is much longer than other mods containing a printed circuit board. Each K100 comes with a protection chip. The chip is easy to use. Just attach the magnetic chip to positive pole or negative pole of li-ion batteries. The chip can protect the battery from short circuit, overcurrent and helps avoid overheating of the li-ion battery. The chip can be used for 18650/18350/18500 li-ion battery. The K100 can use a single 18350 battery, a single 18500 battery or a single 18650 battery by adjusting the body. 510 threading. 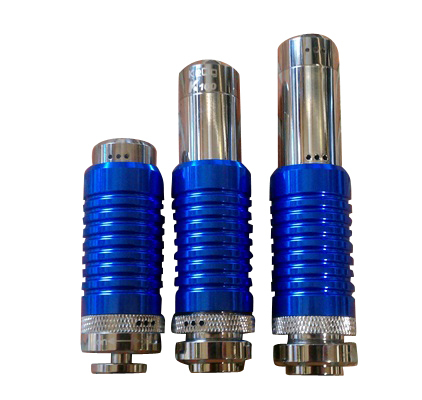 Fits most CE4 style and EVOD's without an adapter - Kanger T2 & T3 require an ego to 510 adapter. Venting is provided by three holes in three parts of the unit (9 holes in total). * UNPROTECTED li-ion batteries can be used with this product. We strongly recommend using the protection chip along with any battery. * Please do not stack batteries in this MOD. Length: 18350 li-ion 73mm - 18500 86mm - 18650 103mm. Material: Anodized Aluminum Material - Plated Chrome. Note: The unit does not include a battery or a battery charger. 1. Only recharge these devices with the intended charging cable or adapter. Using chargers with incorrect voltage or current can cause a fire or catastrophic failure. 2. Never leave a charging battery unattended. 3. Never charge a battery overnight while you sleep. 4. Never leave a battery on your charger longer than necessary. When it is full, unplug your charger and remove the battery. Leaving a battery on charge when it is full will degrade it’s performance and may result in a fire. Indy Vapor Shop will not be held responsible or liable for any injury, damage, or defect, permanent or temporary that may be caused by the use of any battery. Please have a basic understanding of the batteries you are using and how to care for them properly. Read the information found at: batteryuniversity.com before purchasing. It is important to carry batteries properly, recharge properly, and dispose properly. Since we have no control over how a buyer uses the device; no guarantee, warranty, or return privilege will apply, unless the product does not function the first time used (DOA). We regret having to strictly enforce this policy. The use of DIY liquid, improper chargers, modified atomizers, and general abuse of the product has made it necessary.